JAIPUR: In a bid to promote IT education in the state, Rajasthan Chief Minister Ashok Gehlot distributed laptops and money to students here under the Rajiv Gandhi Vidyarthi Digital Scheme. "These decisions and schemes would benefit the future generations, the youth, the students of Rajasthan. They would be empowered to do something in life, to achieve their goals. Today, we have distributed cheques worth Rs. 6,000 to all children who passed medium school so that they can buy PC Tablets. We would also distribute around 112,000 laptops over the period of two years amongst students," said Gehlot. In his 2013-2014 budget address, the Chief Minister had announced that Tablet-PC would be provided to 3,50,000 students in the State. He had also announced that in the second phase of the scheme, 14-inch laptops would be provided to 1,10,000 students of the current and the last session. 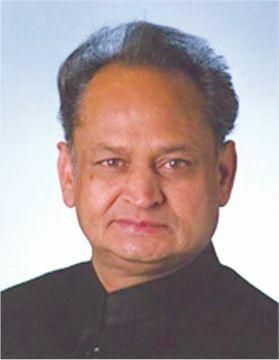 Gehlot used the occasion to add that the scheme had been introduced to fulfill the dream of former Prime Minister Rajiv Gandhi, who wanted the country to enter into the 21st century with full preparation so that India could stand in the line of developed countries of the world. Union Health Minister Ghulam Nabi Azad was also present at the function. Politicians in the country have often used the distribution of free laptops to students as an incentive for them, as well as to increase their party's political clout. The latest controversy surrounded Uttar Pradesh Chief Minister Akhilesh Yadav, whose state government is yet to foot a bill of 900-crore to tech giant Hewlett Packard (HP)-the suppliers of the free laptops.